Slide backgrounds let you include media with a large visual footprint behind your slide content. To insert a background, click on the slide background icon in the top right corner. 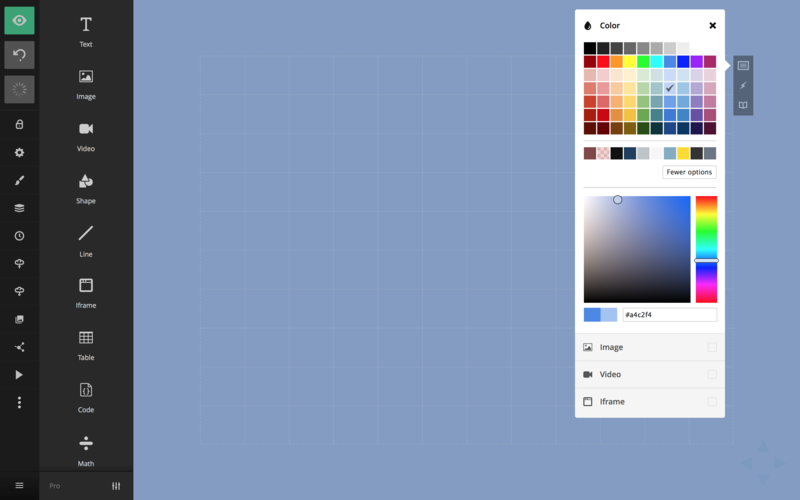 This will bring up a menu where you can select which type of background you want to add. A solid background color behind the full slide. If you combine this with a background image or video the color will appear beneath, allowing you to control the color of letterboxing. Advanced: If you're styling your presentation using custom css, we automatically add a "has-light-background" or "has-dark-background" class to the slide based on which color you use. You can use this to automatically invert foreground colors based on the selected background. 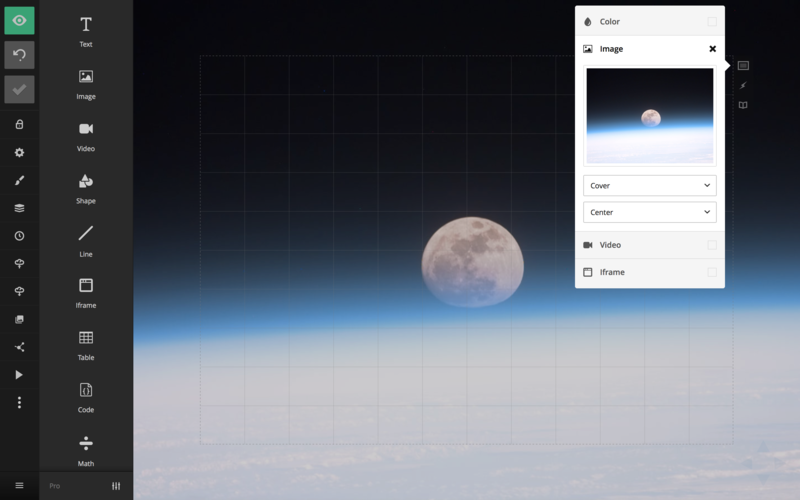 Upload a JPG, PNG, GIF or SVG image to use it as a background. Automatically play a video behind this slide when it appears in view. We support all standard video formats and files up to 100 MB. Note: We always mute videos when viewing in iOS. Videos is not allowed to autoplay on those devices without being muted. "Iframes" are a way to include content directly from another website. 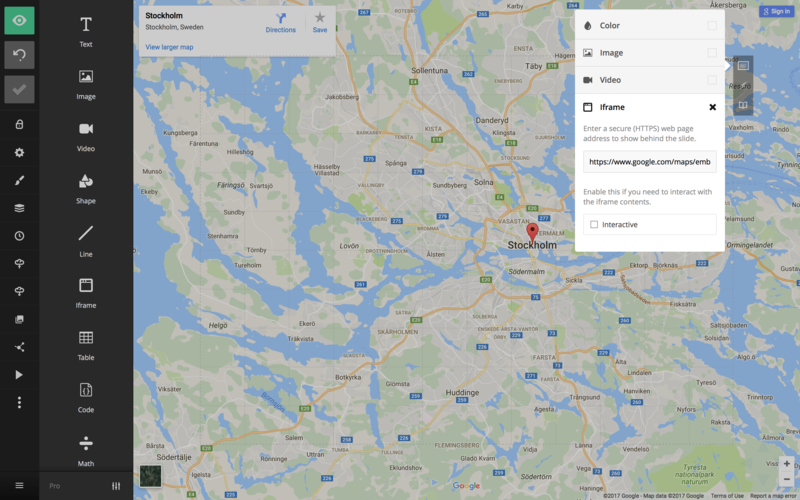 This can be used to embed spreadsheets, YouTube videos, Google Maps and many other types of content. 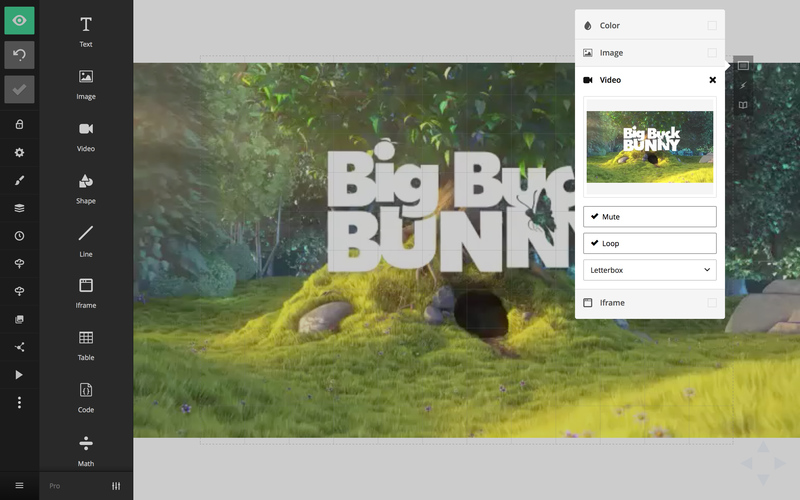 Backgrounds aren't interactive by default since slide content in the foreground is placed on top. If you want to interact with the background, for example clicking and dragging an embedded map, you'll need to enable the "Interactive" option. Note that turning this on will disable all interactivity with the foreground. Can't have it all.